This has got to be the best advancement in hair care ever. It combines the effect of brushing and straight ironing and saves you a heap of time. Imagine taking just 2 minutes to straighten your short - medium length hair or 5-8 minutes for long hair. Most hair straightening can take 20 - 30 minutes of your time or even more depending on your hair type. 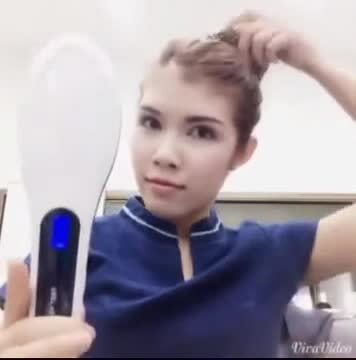 Get the Revolutionary Thermal Hot-Brush and Stop wasting your valuable time, today! So now you can literally leave your hair regime to just a couple minutes before you leave your home for a day at work or a night out on the town. Anti-Burn Protection - The technology behind the Anti-Burn Protection keeps the heat where it's supposed to be and won't burn your hair, ears or your hand! Patented Anion Technology - removes static electricity from your hair and combines with the air to produce moisture, helps nourish the hair and leaves it soft straight, but with volume. Auto shut-off after one hour of use is a built-in safety measure. The "Beautiful Star" Thermal Hot Brush is available at just $79 + Taxes and the price is inclusive of free shipping within Canada. In the unlikely event that your Thermal Hot Brush has a manufacturers defect, please make sure that you contact our office via email on admin@greenhouse-marketing within 14 days of purchase and we will arrange a return with you. Any manufacturer defects will be returned at our shipping expense. The "Beautiful Star" is designed to provide you with years of trouble free service, and this is why we are happy to offer a one year replace or repair warranty. Please be certain to retain your warranty document, your invoice, as well as the original packaging, which will be used to return the faulty product. Details of the warranty are included with the shipped item. * Each & every order helps increase our yearly donation commitment to the Smile Foundation of Canada. Your help gives the less fortunate people in the world with a reason to smile!